Snowberry Scentsy Bar is a customer favorite for the holidays. With a luscious blend of loganberry, strawberry, peppermint and zesty cinnamon, this is the scent of the holiday season. SNOWBERRY SCENTSY BAR IS NO LONGER AVAILABLE. CLICK HERE FOR AVAILABLE BARS. 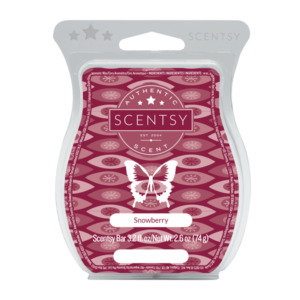 You’ll enjoy notes of ripe loganberries, succulent strawberry, cool peppermint and zesty cinnamon with the fragrance of Snowberry Scentsy Bar refill. This scent is a customer favorite for the holidays. Add 4-5 cubes of Snowberry Scentsy wax bar to your favorite wickless candle warmer and fill the room with holiday fragrance flair to evoke memories. Scentsy Bars have a very low melting point and are best experienced when used as a system in an electric Scentsy Warmer. With over 80 long lasting fragrances, including our Snowberry Scentsy Bar refill, there’s sure to be a favorite for everyone. Each Snowberry Scentsy wickless candle bar is scored to easily break into 8 cubes, and contains 3.2 fl. oz. Iced Pine Scentsy Bar is as refreshing as a walk through a winder wonderland. With notes of green fir, pine and peppermint, this is the scent of holiday memories. You won’t need your warm winter clothes and boots to feel like your walking through fresh fallen snow. With notes of green fir, pine and peppermint, the fragrance of Iced Pine Scentsy Bar refill will leave lasting memories for friends and family. Add 4-5 cubes of Iced Pine Scentsy wax bar to your favorite wickless candle warmer and fill the room with this holiday customer favorite. Scentsy Bars have a very low melting point and are best experienced when used as a system in an electric Scentsy Warmer. With over 80 long lasting fragrances, including our Iced Pine Scentsy Bar refill, there’s sure to be a favorite for everyone. Each Iced Pine Scentsy wickless candle bar is scored to easily break into 8 cubes, and contains 3.2 fl. oz. 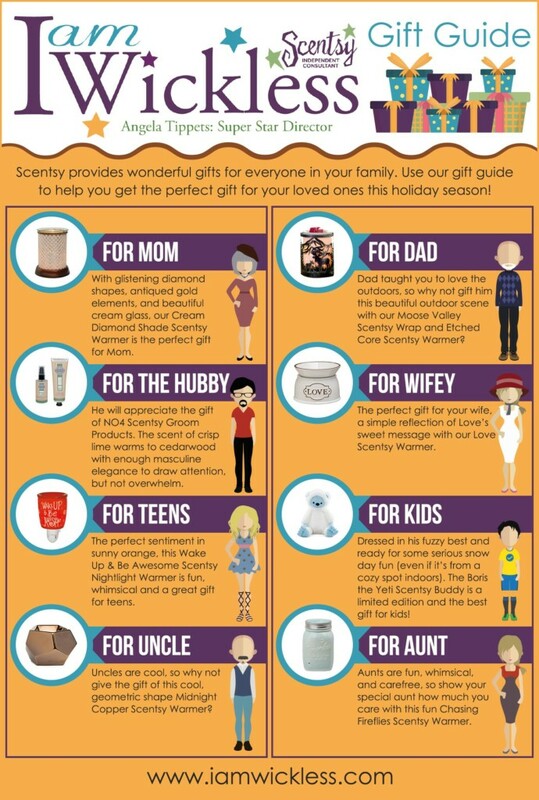 Scentsy provides wonderful gifts for everyone in your family. If you’re looking for the perfect gift this holiday season and beyond, use our holiday gift guide perfect for all of your loved ones! 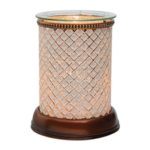 For Mom: With glistening diamond shapes, antiqued gold elements, and beautiful cream glass, our Cream Diamond Shade Scentsy Warmer is the perfect gift for Mom. 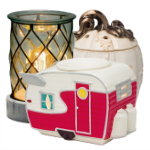 For Dad: Dad taught you to love the outdoors, so why not gift him this beautiful outdoor scene with our Moose Valley Scentsy Wrap and Etched Core Scentsy Warmer? For The Hubby: He will appreciate the gift of NO. 04 Scentsy Groom Products. The scent of crisp lime warms to cedarwood with enough masculine elegance to draw attention, but not overwhelm. 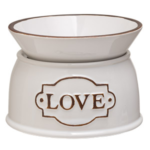 For Wifey: The perfect gift for your wife, a simple reflection of Love’s sweet message with our Love Scentsy Warmer. No lightbulb needed. Uses a warming plate and dish system. 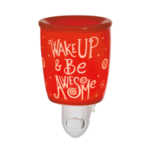 For Teens: The perfect sentiment in sunny orange, this Wake Up & Be Awesome Scentsy Nightlight Warmer is fun, whimsical and a great gift for teens. Comes with a 15-watt lightbulb. For Kids: Dressed in his fuzzy best and ready for some serious snow day fun (even if it’s from a cozy spot indoors). 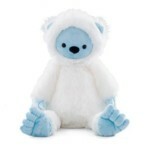 The Boris the Yeti Scentsy Buddy is the best gift for kids! Scentsy Buddies are limited edition, so get them before they’re gone! Scentsy Scent Pak included. 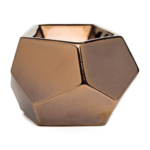 For Uncle: Uncles are cool, so why not give the gift of this cool, geometric shape Midnight Copper Scentsy Warmer? No lightbulb needed for this element warmer. 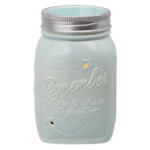 For Aunt: Aunts are fun, whimsical, and carefree, so show your special aunt how much you care with this fun Chasing Fireflies Scentsy Warmer. 7″ tall, includes a 25-watt lightbulb. Eskimo Kiss Scentsy Bar will have you grabbing a cozy blanket, and snuggle up with your sweet heart. With warm notes of blackberry jam, caramelized brown sugar, vanilla and amber, this is the scent of hot holiday romance. The fragrance of the Eskimo Kiss Scentsy Bar refill is romantic holiday bliss. Turn up the heat with notes of sweet blackberry jam, caramelized brown sugar, vanilla, and amber. Add 4-5 cubes of Eskimo Kiss Scentsy wax bar to your favorite wickless candle warmer and fill the room with this holiday customer favorite. Scentsy Bars have a very low melting point and are best experienced when used as a system in an electric Scentsy Warmer. With over 80 long lasting fragrances, including our Eskimo Kiss Scentsy Bar refill, there’s sure to be a favorite for everyone. Each Eskimo Kiss Scentsy wickless candle bar is scored to easily break into 8 cubes, and contains 3.2 fl. oz. The holiday fragrance of Cozy Fireside Scentsy Bar is a customer favorite. With warm notes of holiday spices, zesty ginger, and fresh cinnamon sticks. The holiday fragrance of Cozy Fireside Scentsy Bar refill is a classic for the season. Just the right amount of holiday spices, zesty ground ginger, and fresh cinnamon sticks. Add 4-5 cubes of a Cozy Fireside Scentsy wax bar to your favorite wickless candle warmer and fill the room with this seasonal fragrance favorite. Scentsy Bars have a very low melting point and are best experienced when used as a system in an electric Scentsy Warmer. With over 80 long lasting fragrances, including our Cozy Fireside Scentsy Bar refill, there’s sure to be a favorite for everyone. 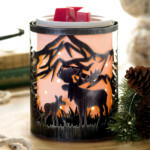 Each Cozy Fireside Scentsy wickless candle bar is scored to easily break into 8 cubes, and contains 3.2 fl. oz. The classic scent of our Christmas Cottage Scentsy Bar is a holiday customer favorite. The fragrance of Valencia oranges, fresh raspberries, ground cloves and holiday spices. The fragrance of Christmas Cottage Scentsy Bar refill is a classic for the holiday season. A blend of fresh picked Valencia oranges, with notes of red raspberry, cloves, and holiday spices that will evoke memories and traditions. Add 4-5 cubes of a Christmas Cottage Scentsy wax bar to your favorite wickless candle warmer and fill the room with this seasonal fragrance favorite. Scentsy Bars have a very low melting point and are best experienced when used as a system in an electric Scentsy Warmer. With over 80 long lasting fragrances, including our Christmas Cottage Scentsy Bar refill, there’s sure to be a favorite for everyone. Each Christmas Cottage Scentsy wickless candle bar is scored to easily break into 8 cubes, and contains 3.2 fl. oz. The classic scent of our Clove & Cinnamon Scentsy Bar will bring the fragrance of the holiday season to all your favorite living spaces. The fragrance of fresh cloves and cinnamon sticks will bring back favorite holiday memories, and celebrate new traditions. The fragrance of our Clove & Cinnamon Scentsy Bar refill is the perfect holiday scent. This is the perfect combination of fresh ground cloves and cinnamon sticks to add the right amount of holiday fragrance festivity fun in your life. Add 4-5 cubes of a Clove & Cinnamon Scentsy wax bar to your favorite wickless candle warmer and fill the room with this seasonal fragrance favorite. Scentsy Bars have a very low melting point and are best experienced when used as a system in an electric Scentsy Warmer. With over 80 long lasting fragrances, including our Clove & Cinnamon Scentsy Bar refill, there’s sure to be a favorite for everyone. Each Clove & Cinnamon Scentsy wickless candle bar is scored to easily break into 8 cubes, and contains 3.2 fl. oz. Finding the perfect gift doesn’t have to be a chore. Anyone from close family and friends to teachers, hair dressers and dog walkers will appreciate Scentsy products this holiday season. But, don’t forget that Scentsy Bars make the perfect gift all year round! With a tremendous selection of warmers and scents, in addition to seasonal options, there’s something for everyone. Our Peppermint Dreams Scentsy bar offers notes of chocolate and a cool blast of fresh mint. It’s a wintery, peppermint dreamland of fragrance. PEPPERMINT DREAMS SCENTSY BAR IS NO LONGER AVAILABLE. PLEASE SEE OUR AVAILABLE FRAGRANCES HERE. Enjoy the cool, sweet fragrance of our Peppermint Dreams Scentsy Bar refill. This blend of fragrance is like a warm rush of chocolate cupcake sweetness cooled by a blast of fresh mint. Add 4-5 cubes of a Peppermint Dreams Scentsy wax bar to your favorite wickless candle warmer and fill the room with this sensual fragrance. Scentsy Bars have a very low melting point and are best experienced when used as a system in an electric Scentsy Warmer. With over 80 long lasting fragrances, including our Peppermint Dreams Scentsy Bar refill, there’s sure to be a favorite for everyone. Each Peppermint Dreams Scentsy wickless candle bar is scored to easily break into 8 cubes, and contains 3.2 fl. oz. These sugar skull Scentsy Warmers are beautiful way to celebrate the Mexican tradition of Dia de los Metros, or Day of the Dead, by honoring ancestors. A sugar skull is an artistic representation of a human skull and can be designed with intricate detail, or very simple. Some are made of sugar, known as sugar skulls, and some are made with other materials such as wood or clay. 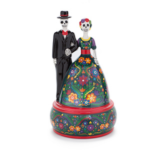 These Scentsy sugar skulls are made of high quality ceramics and will help to honor and celebrate this Mexican tradition. Now you can buy your sugar skull Scentsy Warmers online and have them direct shipped to your door. Start the celebrations early, or leave them up all year for fun conversation pieces. Our sugar skull Scentsy Warmers are bright and beautiful. The Calaca Scentsy Warmer represents love everlasting. Steeped in traditional Mexican folklore, Calaca brings a dramatic cultural flair with expertly applied color and meticulous craftsmanship. This warmer is 9″ tall and is part of our Element Scentsy Warmer Collection so there is no lightbulb, only a low temp heating plate to gently melt your scored Scentsy Bar. 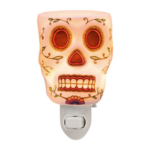 A beautiful artistic representation is found in the details of the sugar skull Calavera Nightlight Scentsy Warmer. Celebrate the Mexican tradition of the Day of the Dead by honoring ancestors. As part of our Scentsy Nightlight Collection, it’s the perfect size to fit in any space and uses a small 15-watt light bulb. Just like the smaller version nightlight, the full-size Calavera Scentsy Warmer is a beautiful artistic piece with outlines of black, and filled with pink and green floral patterns. The hollowed look of the nose and eyes have hollow look with the black. You’ll be reminded of a cultural tradition when the light is turned on with a soft glow. 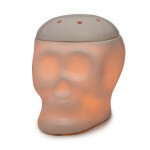 The Calavera Scentsy Warmer is 6″ tall, is part of our Premium & Deluxe Collection, and uses a 20-watt Scentsy light bulb. 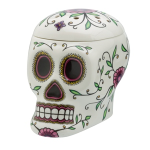 A fun way to personalize your Dia de los Muertos, or Day of the Dead space, is with our DIY Calavera Scentsy Warmer. Bring out the permanent colored markers to customize and make this one-of-a-kind Scentsy Warmer. If there is a mess up, or you want to change the artistic design, simply take rubbing alcohol and a cotton ball and erase your design to start over. Check out the video here to get some ideas. The DIY Calavera Scentsy Warmer is 6″ tall, is part of our Premium & Deluxe Collection, and uses a 20-watt Scentsy light bulb. Permanent markers not included.